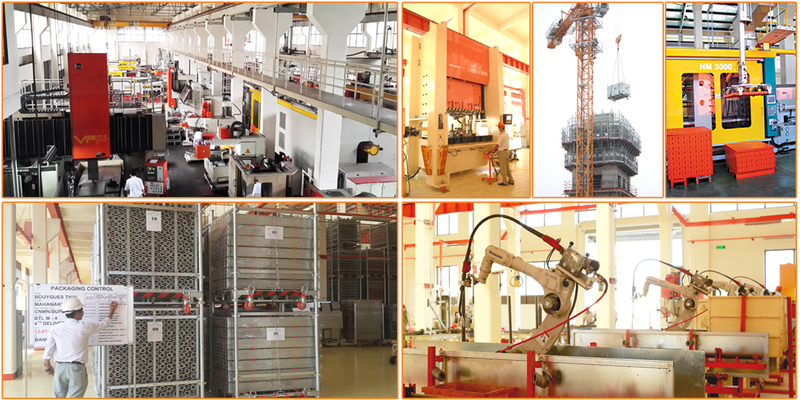 FUVI® Mechanical Technology Company Ltd was established in 1994, specializing in developing innovations for industry and construction needs. With over 20 years of experience in CAD/CAM/CAE, CNC, Molding Plastic, Die Progressive and Robot Welding, we have become a leading innovator for modern construction. The first FUVI® Formwork panel has been introduced since early 2000(s). This was the first time that plastic forming panels were marketed and used successfully anywhere in the world. FUVI® plastic forming panels have been widely recognized over the world as an effective and user-friendly formwork solution for the construction industry, and as an environmentally friendly product. We have been working tirelessly in the improvement and further development of FUVI® Formwork. Our prominent plastic panel form face in diversified types and sizes, has grown and developed into a full range innovative formwork system complied with international standards. Some highlights of our pioneering solutions include innovative support scaffolding, jumpform, slipform, other auto climbing solutions, and optimized storage and transfer solutions. FUVI® brings inspiration and satisfaction to workers, engineers, contractors and project developers – All are in harmony with the environment, and ultimately providing benefits to the society as a whole. Vinh is the founder of FUVI. He holds a degree in Mechanical Engineering, and thanks to his open, analytical mind, he is the driver of innovation within FUVI. Majority of FUVI’s ideas are originated from his mind. Nghiep is General Director of Fuvi Mechanical Technology Company and holds a BS degree in Engineering. Nghiep has been the Vice Director of the company for 15 Years. The Board of Directors appointed Nghiep to be FUVI General Director since July 2017. Nghiep is managing the company’s strategies to create FUVI’s values working in Harmony with people, environment and benefits to the society as a whole. Giac is a Mechanical Engineer with more than 30 years of experience. He is with FUVI since 1994, and has been providing project specific solutions, fitted individually to requirements on site. He and his team strive to transfer the benefits of FUVI to our clients. Tri is Director of Planning & Production and holds a degree in Mechanical Engineering. He has been working with FUVI since 1994, and ensures that schedule, production and quality targets of FUVI’s factories are met. Hieu’s background is in Business Administration. He got BBA in Marketing and MBA in Management. He has been working with FUVI since 2014, bringing a new, modern attempt to the company. His goal is making FUVI’s images as the best partner in client’s success. We sort out and plan on solving any problems extremely quickly as well as stick to the timeline as much as possible. We engage in what humans are naturally suited to do. Thus creating and innovating industrial solutions intuitive to use and in harmony with the nature. Our combination of skills in structural and mechanical engineering provides our clients with solutions thought through 360 degrees. We aim for perfection. Thus, we always strive to further improve our innovations and solutions, never standing still and accepting the status quo. The backbone of our productions are the use of modern, computerized technology for consistent quality and uniformity of our products.